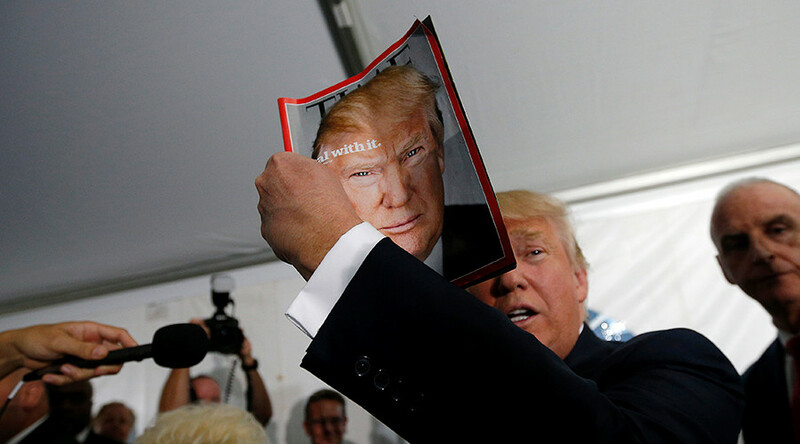 President Donald Trump has been asked to remove all fake “Time” magazine covers from his resorts, after it was revealed that a framed cover of the magazine hung in his resorts is not real. The framed picture has been hung in at least seven of Trump’s golf resorts, including properties in Ireland, Scotland, Virginia, New Jersey and Florida. The Washington Post conducted an investigation to determine whether the cover was genuine and to determine where it has been hung. It pointed to a number of inconsistencies with the fake, including the Trump-like use of exclamation points, the use of thicker lines and the incorrect positioning of secondary headlines. The Trump Organization didn’t respond to requests for details about who created the cover and why. “We couldn’t comment on the decor at Trump Golf clubs one way or another,” White House spokeswoman Sarah Huckabee Sanders told the Post. Time confirmed there was no March 1, 2009 issue, but a March 2 issue had Kate Winslet on the front. “I can confirm that this is not a real TIME cover,” Time spokesperson Kerri Chyka told the Post. Trump tweeted an attack on Amazon, the company of the Washington Post’s owner, Jeff Bezos, on Wednesday. He accused the Post of being fake news and accused Amazon not paying internet taxes.